Today’s guest author is Jason DaSilva from AXS Lab, a non-profit organization focused on accessibility issues in Brooklyn, New York. When I Walk was the recipient of a Google Earth Outreach Developer Grant, funded through the Google Inc. Charitable Giving Fund at the Tides Foundation. We’re excited to showcase how When I Walk has used the Google Places API to make finding accessible businesses easier for anyone in a wheelchair. When I was diagnosed with multiple sclerosis seven years ago, I didn't realize how much it would affect my freedom and decisions in regards to where I could or could not go. Not being able to walk created barriers. For example, on the street lined with stores and businesses, I'd only be able to get into one out of 10 of these places. Only the places that had wheelchair accessible entrances were available to me. So I came up with an idea. Why not document and track all be accessible places around us? If there was an online database of accessibility hotspots in any given city, the disabled community and their supporters can share all the places that are accessible with each other. Google Maps provided the easy-to-use map platform for people to search and find these places. So voilà, with help from funders and our developer Kevin Bluer, AXS Map (pronounced “access map”) was born. Watch a short video about AXSmap. With AXS Map, you can document how easy it is to enter a restaurant with a wheelchair or cane or whether the restroom is wheelchair-accessible. With all of this information available on the web, the disabled community is able to easily find places to eat, sleep or get a haircut. With our recently launched mobile app for Android, built using the Google Places API, AXS Map users can now find and review businesses while they’re on the go. 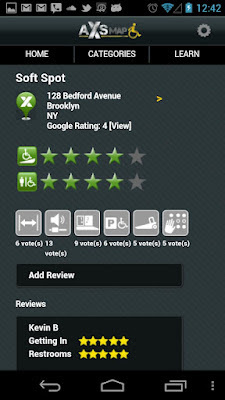 Download the app now and share a review on the accessibility of a business or public place. The more you review, the better AXS Map gets! 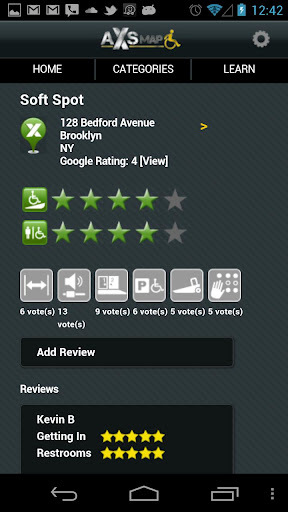 Learn how to use the AXS Map app to review places. I hope that AXS Map makes it easier for you or someone close to you to find accessible businesses in your own community. Editor’s Note: Today’s guest author is Jason DaSilva from AXS Lab, a non-profit organization focused on accessibility issues in Brooklyn, New York. When I Walk was the recipient of a Google Earth Outreach Developer Grant, funded through the Google Inc. Charitable Giving Fund at the Tides Foundation. We’re excited to showcase how When I Walk has used the Google Places API to make finding accessible businesses easier for anyone in a wheelchair.